Tips and Tricks for your Joomla and WordPress based website. There is nothing worth exciting when you're sales wheel keeps moving in a handsome pace. Your sales ratio is constantly breaking all previous record and hitting all goal set month after month. But forgot to add, your revenue is still defeating your expectation. even sometimes it touches the ground. The strategy and tactics were effective for the previous years but not adding new number to the revenue figure. If your marketing pitches and techniques have really become outdated to the current trend, and your competitor publishing case study leave your frustrated a lot. It’s high time to rethink the way you do sell. To comprehend the sales boost up tectics, I personally found many entrepreneurs declared unredeemed rewards on the fulfillment of the ambition set. and other hire new head to strengthen sales team. Combining all the strength, when sales statistics always kisses the surface wall, the situation really becomes alarming. So, if you really want to supercharge your eShop sales ratio and want to gain strong standing in the current market, you have to deploy all your time, money and creativity to think differently from others. Look on 5 tips i have created to get you stand out right away. Your product might have ruled the market for past couple of years. but today it may not kick in. The reason you might be failing to draw exact need of customers. So, lock your office, meet your clients on dinner and give yourself change to directly listen their needs. You can also ask them for some suggestion for your products and tactics for defeating competitors, these suggestion are considered more valuable than online or offline survey. Habits and trends are interconnected dynamic concern that holds key of sales ratio. If your target customer are youths, keep eyes on their habit and the trend they follow. we all know about Instagram and aware of it 182% growth rate. Couple of the days ago one. I read a casestudy on Urban Truth (a clothing brand and a venture of Pride Group). Urban Truth successfully employed Instagram as marketing medium through customer generated reviews and contents. The consequence they are succeeded to created a sense of community among their customers and made them fell in love with the brand! Either it’s a religious festival or shopping holiday people trend to wait those occasion to buy bagful of products availing a exponential competitive discount offered. You might have noticed we give you time to discount our Joomla templates in different occasion like Cyber Monday, Black Friday, Thanksgiving and so on. You guys enjoy best best products saving a lot of money whereas we enjoy significantly record selling in those campaigns. Don’t believe in this idea. Let me give a real and viral example. We all know about the Chinese eCommerce giant Alibaba Group Holding Ltd and it record breaking sales which brought the company $14.3 billion in total sales volume during china’s shopping holiday, “SIngles Day”. So, set your marketing campaign targeting shopping events and religious festivals. It has statistically proven that maximum startups or established companies earn more than 50 % of their total yearly revenue from shopping day and religious sales. Your team members are hard worker and they love to work dedicatedly for your company. But the progress is still standstill because you're following the market research completed on company inception or following your intuition. Don’t forget, survey defeats intuition. Keep doing it, and it’s results can give you such an important information about your customer, that you never imagined before. Sometime a simple teak in business mode can pull your sales ratio at peak, It’s important because, you are selling something that won’t prompt people to buy it, or your product or price does not fit the market the way it used to. So, direct your team to investigate the market and figure out where problem lies. If you are succeeded, at the end of the day, you will have customers knocking at your door as they did before. But twerking business model brings site owner a new inconvenience like eCommerce component doesn't support functionality you look for new business model. So, we crafted a best eCommerce extension for Joomla, DigiCom. Now we can sell single and bundle products seamlessly. Depending on target customer and business models strategies could be different, even overall country environment can give birth new strategy and pitches. If i missed any important point, feel free add in comment. To turn your dream into reality, there are plenty of technical aspects need to kick in along fresh and professional site contents. Without going to describe them all mediocrely, I am going to share proven tactics to speed up Joomla websites, which is considered one of the most significant ranking factors according to Google. Why speed is important? Several studies shows that fast loading websites can significantly increase conversion and boost in sales. 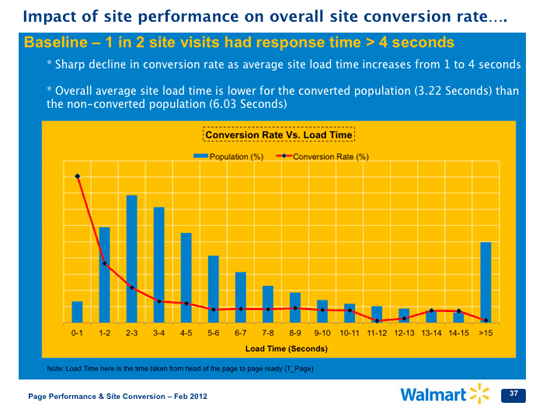 A couple of years ago, Walmart announced that their conversions touch the peak when site loads within 2 seconds, and it progressively drops as page loading time increases. In the following chart, you can notice how overall conversion and sales fluctuate when site speed falls from 0-1 to 3-4 seconds. Another study by Kissmetrics shows that 40% of people abandon a website that takes more than 3 seconds to load. I know having read those real life example, you guys want your Joomla website should be loaded fast. For your convenience, I’m going to share some useful tips and tricks of Joomla speed optimization. Before digging into the in-depth instructions, I recommend you to check Joomla performance or how fast your Joomla site currently loads. To check site loading speed, there are numerous tools available in the market. I have created a list of trusted by millions because the tools not only can measure site speed and overall performance, but also provides details reason that make a website slow. Now you have clear understanding of your overall site performance and loading time. Before going to follow my instructions, take a complete backup of your Joomla website, then make step by step enhancement. After completion of every step, get back to the site front-end, and make sure every part of your website functioning accordingly. Taking right decision while selecting best Joomla hosting is considered the key for speed up Joomla website. Thinking why? The files of your website are virtually hosted on a remote server. When a end user hits for your site URL in the browser address bar, and If it takes time to retrieve data from server to your end clients, definitely your site loading time is going to be increased and your are going to lose a significant amount of traffic. So what would be the best solution? To cover the question, we prepared a wonderful guide to select best Joomla hosting. I would be your find them amazing, enjoy the reading. The plugin based model for feature extension sometime loads unnecessary features and bloated codes in maximum CMS. Nothing different for Joomla. With several years of Joomla template development, I used many of tremendous Joomla extensions comes with awesome features. But your site may required to use single features, but other remain unused and become reason for poor site speed and conflict. So, remove the unnecessary plugins and install lightweight and need specific Joomla extensions. To enable the Joomla caching, first head the System from Global Configuration, select ON - Conservative caching option from cache dropdown field, and select Save button. Have a look in the following image. Yahoo says “Gzip is the most popular and effective compression method currently available and generally reduces the response size by about 70%. 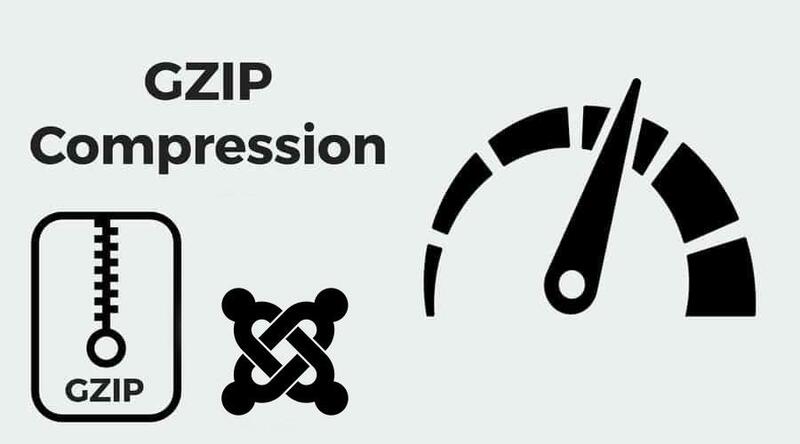 Approximately 90% of today's Internet traffic travels through browsers that claim to support gzip,"
Content delivery network (CDN) is an incredibly simple way to supercharge your Joomla site and Joomla performance. A CDN is an interconnected system of cache servers that use geographical proximity as a criteria for delivering Web content. If you enable a Content Delivery Network, your static files will not be served from the location of your web host, but from the global network of servers of your CDN provider. Images Put serious value on your website. You cannot deny the role of images on your website. Images increase the load of your page and it needs more bandwidth than rest of the elements of your webpage. To ensure fast loading of webpages you must optimize images of your website. There might be question on your mind “If I reduce the image size, will it affect the quality?” Actually there is a lot tools available in the web, you can use tinypng, remush.it, PunyPNG, etc. This tools will optimize your images losslessly, there will be no compromise with the quality of your image. Merging Several files into one. If you do not know how to do it, you can do it by using extensions like JCH Optimize, JBetolo, ScriptMerge from Joomla extension directory. JCH Optimize extension also allows several functions for Joomla speed optimization. 50% of web traffic comes from mobile and tablets. If you do not want to lose half of your traffic, it is necessary to optimize your mobile pages too. You can take Mobile-Friendly test from google to check mobile friendliness of your site. If you get a really poor score consider optimizing it. If you do not know waht to optimize, you can use the PageSpeed insights Tool by google. Hotlinking increases server load and makes your website slow. It means stealing your bandwidth and it occurs when any other sites uses direct link to the images on your site. At here I have given my feed (from Feedxpert). You have to replace it with your feed’s name or else your images might not appear correctly. Lazyload helps you to speedup your page loading process. It only loads the images, above the fold load or those images which are visible to the browser window of user. When the user scrolls down, the below images starts to load before the appear on the window. This just not only increases the page loading speed, but also save the bandwidth by loading less data for visitors who doesn’t scroll all the way down. You can do this automatically, just install plugin like LLFJ or JSLazyLoading from Joomla extension directory. When you are done with your post and published it, why would you need the stored draft? There might be 8-9 or even more drafts saved. This drafts slow down your site and therefore you need to control your revisions. Set the revisions to 2 or 3 so that in case of any mistake, you can fall back. Either you're using Joomla templates and WordPress themes, user generated Joomla comments and WordPress comments are important. It bears a testimony that your posted masterpiece is helping others tremendously. Visitors are found to and fro across the site to site to find out their desired contents. Before getting into your well-researched blog post, they try to find some significant traits which give them reason to read further or bounce. Now the question is what are those traits, right? In my opinion they are not so many, but the most important elements are - huge post views, social shares and positive comments. Among those, good comments are the most effective, it allures the dark horse to be well-acquaintance of your website. But what if your post comments are full of spamming? definitely you would lose significant number of constant traffic along with the following inconvenience. When you’ve websites like ThemeXpert with tons of useful blog posts, You would constantly start receiving comments in your maximum viral posts. With the useful appreciation you found spammers are trying to spam in your comment. Consequently you have to spend time to keep them up-to-date frequently. If you couldn’t manage time to clean up your website from spammy comments, visitors will pipe through other website easily. Either you are running Joomla or WordPress websites, if you don’t turn on comment filtering for malicious code, hackers can hack your site putting malicious code via your site commenting system. If a website fails to load within 5 to 8 seconds, statistics show that visitors start hitting back button with waiting for site comes in. On top of that the continuation of bounce rate keeps increasing. In this circumstance, Google may penalize your site and demote your site with lower ranking. Google always hates bad links, If you don’t manage time to moderate your site comment, Google think you’re allowing bad links into your website, the Google bot won’t care whether the link are attached in the commenting system or elsewhere. Now you might be thinking what would be ultimate solution to keep your site away from such an inconvenience, right? According to my experience I found default commenting system of popular CMS like WordPress and Joomla requires tons of configuration to make it safe from unexpected danger. Even in my whole career I found many of CMS power users find difficult to add spamming safety configuration, let alone the new comers. To comprehend this issue, we have to find component which will be ultimate solution package, allows automated settings enability by default. Now the question is which component provides all possibilities all together, the answer is simple, that is Disqus Joomla service. Look on the reason why I provoke to choose this awesome 3rd commenting system for your Joomla websites. The commenting system doesn’t affect your site speed. It loads separately from Disqus on your Joomla websites. If you’ve website with a tons traffic, you don’t need to reload your site to see the latest update of the most recent comments. Everything will be updated live within your single blink eyes. Commenting with Disqus requires to login first, As a result only human can post comment, forget about the abusive behavior of dangerous bots. Social media is one of the finest place where you can reach people according to your interest easily. 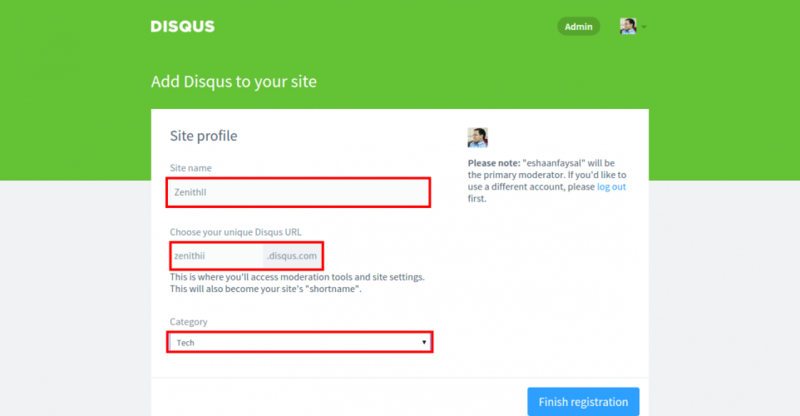 Disqus Joomla service comes with instant signup functionality with social media channels. If anyone signups with their social account, and comment in your blog. It’ll automatically posted the comment in their associate social media channel. Moderation of comment is essential to make your site atmosphere professional. To give the utmost flexibility, Disqus notifies it users via email when new comment is dropped, simultaneously you can approve,delete, and every reply those comment, directly from your emails. Enjoy the flexibility. Your brand may have an unique identity, you want to adapt the overall every aspect of your official website matching your brand core color. To personalize the 3rd party commenting system to your brand it allow you to change default comment avatar, add CSS to personalize the look of your comment. 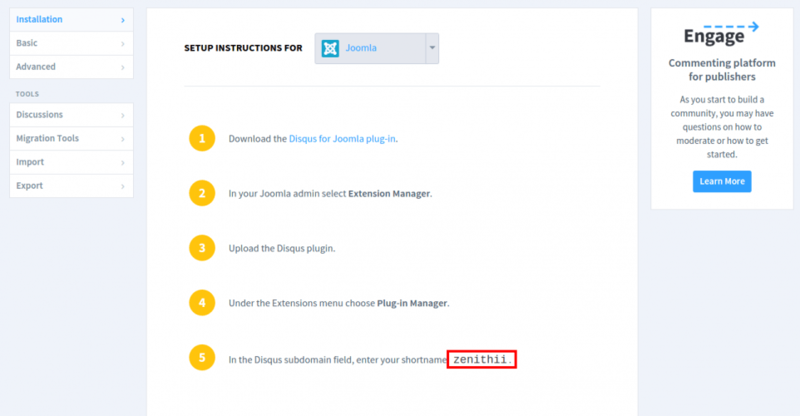 Having learnt about the benefits of Disqus Joomla Service, now I am going to show you how you can install Disqus comment in your Joomla websites. Let’s dive in. Heading over to the Disqus.com, you have to sign up first with your email first. If you have already a registered for this site, Get into this link to add Disqus to your site, add site domain name or subdomain name in the site name field, choose Disqus URL and appropriate category. I am going to demonstrate the demo on zenithII template , so fill the empty with relevant details. When you fill the form correctly, select Finish Registration button. Disqus provides compatibility with all popular CMS in the market, select Joomla as your platform in this stage. After the previous selection of Joomla icon, you will be redirected to the following page, which includes the details instruction which plugin to download to integrate as Joomla Default commenting system. Copy the Shortname. Though above image shows the instruction line by line, I am going to describe it thoroughly. Login your Joomla backend, head to the extensions manager and install this Disqus for Joomla plugins. Head to the plugins manager and search for Disqus, The search result will bring you two items, the first one is DISQUS Comments for Joomla and another is System -DISQUS comments for Joomla. Click on the first result to edit existing settings. In this details page you will found a couple of field that you have to fill with relevant information like Shortname, category and menu item selection where the Disqus comment will be loaded. We have our shortname “zenithII”, I field the shortname field with zenithII. selected blog as category, and DigiCom as menu item. When you filled your select the save and close button. Now head to the category section where you loaded the plugin, for demonstration I have rendered the plugin in our blog section, you can load any where you think important. Have a look on the image below. Want enjoy the full feature of this 3rd party integration? you have to log in your Disqus account, where you can find unmatched opportunities of robust comment management. Like you can add collaborator to moderate site Joomla comments, customize default look on the commenting system and so many more. You all know the motto of ThemeXpert blog is to educate and facilitate our clients with technical as well as informative contents. A couple of weeks ago we published a useful content, A Complete Joomla! SEO Guide. We’re glad, you guys find the article helpful. But SEO is considered the easiest and most difficult job in online marketing. Do you know why? Let me quote a quote of Dave Naylor first before coming to the answer. He says “My rule of thumb is to build a site for a user not for a spider”. To gain a strong position on SERP (Search engine results page) maximum developers care spider readability instead of emphasizing user friendliness. Consequently browsers change their search algorithm frequently. A statistics says only Google changes search algorithm more 600 times a year. So, you could understand without spending dedicated time for SEO, It would be difficult for to reach expect destination single-handedly. If you fail to spend enough time improving your SEO benefits, you hire someone or firm proficient in SEO consultancy. Looking for a proficient search engine optimization (SEO) consultant could be daunting. One thing you have to bear in mind SEO is the beginning of your website’s overall marketing strategy. If you or your recruiting team do not have sufficient knowledge or experience of judging candidate’s quality, you might wait for expecting nothing. Here 18 questions to consider in the perspective of SEO consultant. 01. Am I ready to hire a SEO consultant? This is the most substantial question you should answer yourself first. You should circle your expectation, set the SEO goal and sum up your budget. Before hiring an SEO consultant or a firm. This initiative provokes you to take cost effective and future proof decision. 02. Does the SEO consultant have previous client list? People are evaluated by their work and talent. You will find a professional SEO consultant very frank and do not hesitate to share their client list and their contact information. Such information is really helpful for both consultant and for you. You can easily gauge effectiveness of candidate and verify his indeed work on SEO campaigns. 03. How many projects did you work on and what is their success story ? The consultant is sitting before you, may have worked with renowned companies. But it isn't going to give any benefits. Because renowned companies may have their brand value. Ask him, how many successful SEO campaigns did he involved with and asked for an explanation why the campaign saw the light of a successful day. 04. How will you pull up my search engine ranking ? If you think the interesting guy is capable to the field, he has been called for. Ask him to make everything steer clear how he is going to drive up your website ranking. This is the very tricky situation for the consultant, he might not clear his secrets easily. In this circumstance you have to a bit strict and ask him. How is he going to initially review your website and kick out the problem that is responsible for your site’s lower ranking including broken links and error pages. How he is going to implement on-page optimization process to make your website search engine friendly. On-page is created with technical structure such as internal liking, developing web pages, keyword research heading and tags. 05. Do you really care about Webmaster guideline ? Webmaster guideline is a total guide of a search engine how they control search quality. Violation of guideline must result in you website’s low ranking penalty or ban from the search result for lifetime. Ask the promising consultant, does he strictly follow search engine webmaster guideline. Farley Google webmaster prohibits many common SEO tricks, including auto generating spammy content and adding bogus hidden text and links. 06. Will you ensure guarantee my website will always stick in the topest ranking on Google, Bing and Yahoo ? If the confident candidate answers yes, ask him three times, If he is constantly answering yes, yes, yes.You should stand up, put your mobile phone in the pocket and run to the other direction as fast as you can. Because the guarantee is totally bogus. It’s impossible to guarantee for such promise. But the promise could be true for seasonal marking not for permanent business. 07. Did you work for enhancing local search results ? Your site is for a product which has growing appeal in international market and local market as well. If the SEO consultant only focussing international customers, he might deprive your local people to reach you. If your website is optimized for "local SEO,". It should pop up when someone nearby is search for a keyword that are relevant to your products. To gain this, ask the candidate. Is he familiar with local SEO and Can he add business’s city and state to website’s title tags and meta description. 08. which sector are you specialized for ? If you are ready for spending handsome amount of money right away. Ask your SEO consultant, Is he specialized in the industry you deal with. Suppose you have a business of the shoe selling company. But the consultant doesn't have any prior knowledge and experience to work with the shoe selling company. And you have been pleased with his buttery words. Unfortunately, you have signed a contact paper with him. If you do so, you have to wait for a long while to enjoy the win-win situation. Because your consultant is going to spend minimum a month only getting familiar with your business let alone setting strategies of SEO. Whereas your competitor will have won the battle of competition. 09. Are you familiar with White Hat, Gray Hat, Black Hat SEO technique? Though this question might have made your consultant laugh. He might consider this question as childish question. Because he is a consultant and it is reasonable for SEO strategies, he knows such stuffs. But it is important for you to contract. Unfortunate your site has been imposed a low ranking penalty and you asked your consultant to clarify the reason. He might avoid showing reason of penalty is his unfamiliarity with Black Hat SEO. 10. Do you familiar with the latest update of search engine methodology? Search Engine frequently change their searching algorithm to give its searcher a quality contents. But I think, It won’t be difficult for SEO experts if search Engine changes their algorithms 100 times in a year. ufff, I am forgetting things again. Only Google changes its search algorithm around 500–600 times in a year. If your SEO consultant is not keeping updated himself with those changing algorithm, he is not appropriate for you. 11. Can you take Data driven decision ? Decision making has long been a subject of study and given the explosive growth of Big Data over the past decade, Even Big data is considered the strength of a business. Your company might have a database full of data stored after investing millions of dollars. But it would be worthless, If your decision making team is still using their intuition and spending minimum hours to buying single stationary. If you are expecting vast from the SEO consult and he is not accustomed to take data driven decision. You may have to pass sometimes counting stars. 12. Are you familiar with competitor analysis ? SEO is a zero sum game and analyzing your competitor's websites is a key process of search engine optimization. Because this is the main motto of SEO experts, Their unexpressed endeavor is to defeat you competitor SERP position down and pull up your site’s content up. SEO experts passed thousands of seconds itching their head, finding the reason, why your competitors are defeating your site. If you consultant does not care about competitor winning SEO tactics, he might be leggin himself behind from the stream. 13. Are you familiar with web development ? If you are really satisfied with the consultant make sure he is familiar with web development and the web technology helps to create search engine friendly URLs. Maximum sites are developed by developers who develop a website without having instruction of SEO. If he identify the tweak for SEO, can keep himself one step forward. 14. Have you noted my each expectation from you ? Before signing a contract with SEO consult, make sure you have steered clear your expectation. Where you would like see your website? How much traffic do you expect in a month? Where from the SEO consultant is going to start? And so on. 15. Will you feel any hesitation to share relevant changes you’re injecting to my site ? An ideal consultant feels free share his tactic is taking to improve your site SEO. Moderating the consultant’s work is really important. If you packed with knowledge which strategy harms your site’s SEO reputation. You can easily evaluate the changes what he did. If he asks for website file access permission to add title tags, provide some copywriter to prompt visitors get website directly from the search engine result page. Feel free to share site info and access. 16. 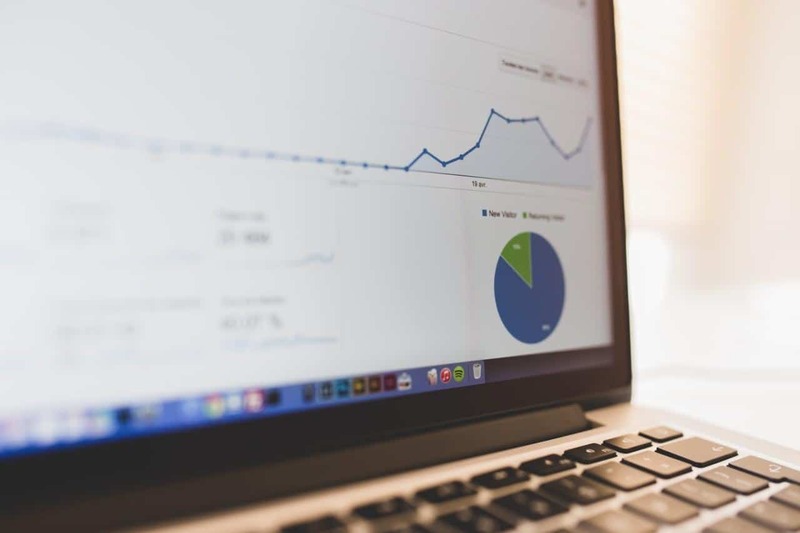 How do you measure the success of your SEO campaigns? When you have signed a contract paper, you had made all strategic how you are going to measure SEO campaign success. Even you have set argumentative duration of success. But you don’t know how to measure, It’s pretty easy. To gauge the success of SEO campaigns, stick your eyes on Google analytic, and conversion rate and your site’s ranking. 17. How will you communicate with me? Your SEO consultant may over-communicate with you, it doesn't not mean he is doing a wonderful job in SEO. If he fails to give you information what you want, ask for more, A reasonable consultant will be delighted to share. Always ask him to report of traffic, ranking, conversion rate after a logical duration, It helps to create a regional responsibility to the consultant. 18. How much would you like paid? This is the what the consultant is still sitting before you. You need to know how much you will be charged. But charge could differ based on the project's size and complexity. Even it varies from constant's experience and quality. Some consultants charge per hour and some charge monthly. On top of that confident consultants charge based on campaign success. As I have cleared in the introductory text, before hiring an SEO consultant it is mandatory to have perfect knowledge of SEO or your expectation. I have discussed here the major aspects of selecting an SEO consultant or firm, but a lot of optional facts have still remained discussed such as: Consumer psychology, Sitemap submission, Webmaster tool proficiency and so on. But don’t worry, An SEO consultant is always familiar with those facts. Did you know that append &format=feed&type=rss to any URL in joomla to get it as RSS ? Meet Crunch a Social Business Template for Joomla! Finally we are very glad to release Crunch as a social business template for Joomla 2.5 and 3.x. Though we promised to release a major template on the first week of every month, but we very much apologize for being late. Releasing template has delayed due to server problem and new site launching. Crunch has a number of eye-catching preset styles by default. But, with its potential style manager anybody can customize these preset styles according to one's needs and demand. In this majestic template we have applied some of our familiar extensions, such as Parallax slider, Xpert slider, Xpert tab. We created a brand new portfolio template for k2 and you can see it from K2 category template dropdown list. Without any configuration just save the category and start adding your item out of the box. As you are expecting that the template will give you support about social networking needs, in that case Joomsocial will satisfy you. We are giving a 15% discount for Crunch, valid till 3th July 2013. Just use CRUNCH15 as your coupon code at checkout. Its been a long time we didn't released any e-commerce template and we realized this is the right time to release an e-commerce template. Christmas is around the corner and you want to facelift your shop? 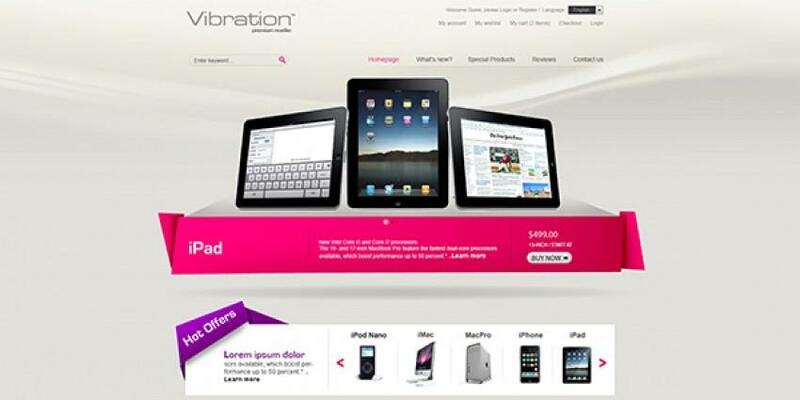 Vibration, our December e-commerce template will help you to increase your sales and attract more customer. We are planning to release a series of e-commerce template and Vibration is just the vibrating beginning :). Its powered by our joomla template framework and wrapped up by many popular joomla extensions such as Virtuemart for shop, K2 for blog.